It's time for another round of The Food Lab. Got a suggestion for an upcoming topic? Email Kenji here, and he'll do his best to answer your queries in a future post. Become a fan of The Food Lab on Facebook for play-by-plays on future kitchen tests and recipe experiments. I'm gonna come right out and say something that I'm sure you won't all openly agree with: McDonald's french fries are great. At their best, they are everything a french fry should be: salty, crisp, light, and not greasy. Granted, you get the occasional odd franchise that lets'em sit under the heat lamp for a couple hours too long, but on the whole, I find it remarkable that the bigwigs have discovered a way to create a frozen fry that even a one armed eyeless chimp has trouble screwing up. And I know, because they've got one working the fry station at the franchise on my corner. To be absolutely honest, I've never been able to make fries as good as theirs (shhhhh!). Sure, my thick-cut pub-style fries are super-potatoey and fantastic, and when I'm in the mood for them, my seasoned steak fries can't be beat, but for thin, super-crisp fries (I'm talking the kind that only appear in fast food restaurants and French bistros under the name frites)? I'm always better off running down to the take-out window than bothering to fry them myself at home. 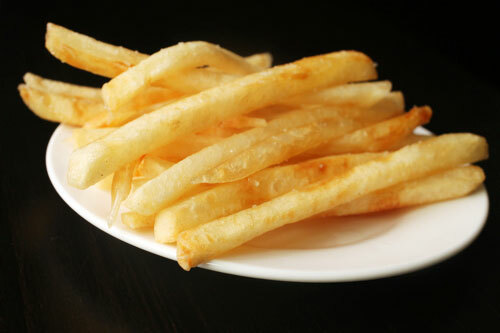 I've been literally giddy with the quality of the fries that have been coming out of my kitchen for the last two days. My wife won't hear the end of it. Even my puppy is wondering why his owner keeps exclaiming "Holy s**t that's good!" every half hour from the kitchen. I've cooked over 43 batches of fries in the last three days, and I'm happy to report that I've finally found a way to consistently reach crisp, golden Nirvana. 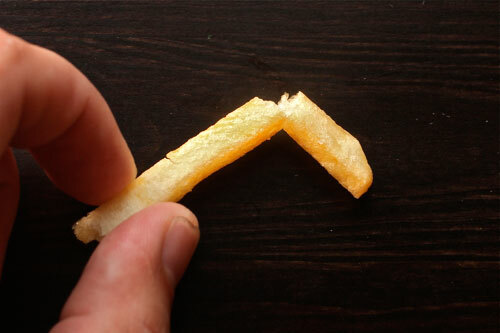 In order to achieve this crispness, the surface structure of a fry must be riddled with micro-bubbles. 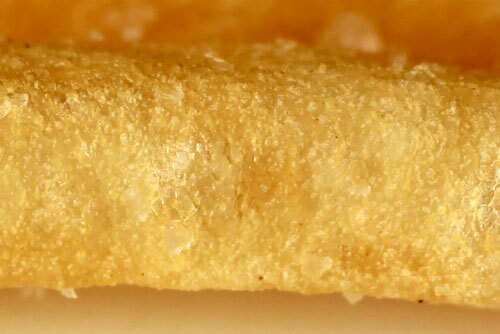 It's these tiny crisp bubbles that increase the surface area of the fry, making it extra crunchy. Ideally, this layer should only be as thick as it needs to be to add crispness. Any thicker, and you start running into leathery territory. Fries with a pasty, mealy, or gummy interior or even worse, the dreaded state known as "hollow-fry" (when the interior is missing entirely) are an automatic fail in my fry book. So how does one going about achieving these goals? The traditional double fry method (once at low temp, then again at high temp) works, but it's far from foolproof, and fails to meet all of the requirements I've set for a perfect fry. 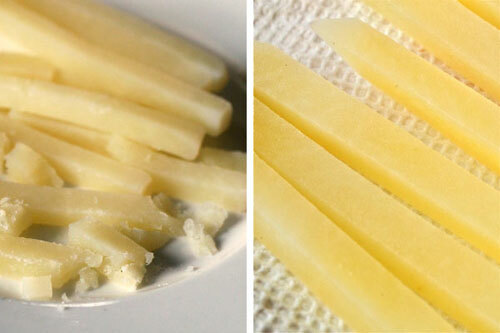 For one thing, the fries inevitably come out too brown—some times massively so. For another, they lose their crunch within a few minutes after coming out of the fryer. Clearly the method needs an overhaul. 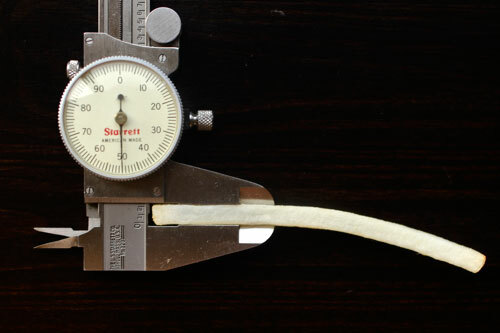 I suppose I could do what the McDonald's Corporation did and spend millions of dollars researching exactly how to accomplish fry perfection time after time anywhere around the world, but unfortunately Serious Eats doesn't pay me well enough to do that. I'm also understaffed, to say the least. So I decided to go with the next best alternative: steal their recipe. Anyone with a buck can get a batch of fully cooked McDonald's fries, but I was after something more. I wanted to get fries from the store in their fully frozen state so that I could examine their surface for clues on how they were parcooked, as well as attempt to fry them myself at home to discover if there is any secret in the fry oil in the shops. I figured I'd be just be able to walk into the store and order them straight from the cashier. "Welcome to McDonald's, may I take your order?" "Yes Ma'am. I'd like a large fries please, hold the cooking." I know she's already said no in her head, but I press on just the same: "Um... I'd just like the frozen fries please." "I'm sorry sir, we just don't do that." Time for some intimidation tactics: "Ok. Could I speak to the manager please?" Sh*t. I bring out the really big guns: "Listen, the thing is, my wife is pregnant—like really pregnant—and she sent me on a quest for McDonald's french fries. But she only likes them really fresh, like straight out of the fryer fresh, so I figured I'd just get some frozen, and fry them for her at home. You know how it is. Women—no accounting for'em, right?" She remains unimpressed, and needless to say, I go home fry-less, contemplating whether attempting to leverage an unborn, un-conceived son in exchange for a couple dozen frozen potato sticks is grounds for eternal damnation. Thank God I'm an atheist. The plan involved me printing out a fake list of items needed for a Scavenger Hunt sponsored by "The Simplot Foundation." A "Mr. Simplot" had endowed an annual prize for the winning team of the scavenger hunt, which would be used to fund the "research projects of the members of the winning team each year." (Members also had to belong to the Harold McGee Society and Order of Brillat-Savarin). I said I needed FROZEN fries, which really perplexed her, but my young McD's associate friend explained the concept of a scavenger hunt and soon enough I was invited into the kitchen and she grabbed a handful of fries and placed them in the zip lock bag I brought with me. The handoff was made the next day, and I finally had a batch of frozen McDonald's fries on which to operate. McDonald's used to fry their potatoes in beef tallow, giving them extra flavor and making them extra crisp, but they stopped doing that years ago. But perhaps there's still something magic about their oil? 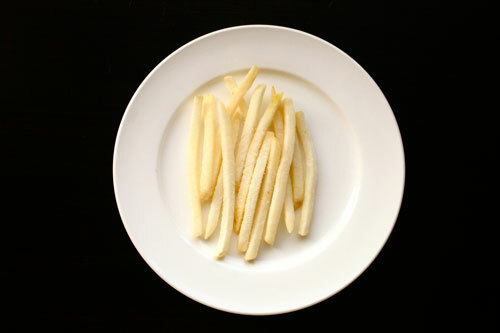 To test this, I fried up a batch of the frozen fries in 375°F peanut oil, letting them cook for about 3 minutes before draining, seasoning, and tasting. The fries are then flumed out of the A.D.R. room to the "blancher." The blancher is a large vessel filled with one hundred and seventy degree water. The trip through the blancher takes about fifteen minutes... After the fries leave the blancher, they are dried and then it's off to the "fryer," which is filled with one hundred percent vegetable oil. The oil is heated to three hundred and sixty five degrees and the fries take a fifty second dip before being conveyed to the "de-oiler shaker," where excess oil is "shook off." So McDonald's does indeed use a double fry method, but it's far from the traditional one. 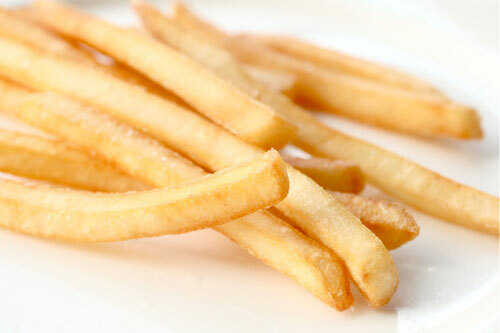 Rather than a slow low temperature fry for the first round, the fries get dunked into very hot oil for only 50 seconds (the second fry is then carried out at the actual location). In addition to this, the potatoes get a pre-fry blanching step in hot water. What could the purpose of this be? 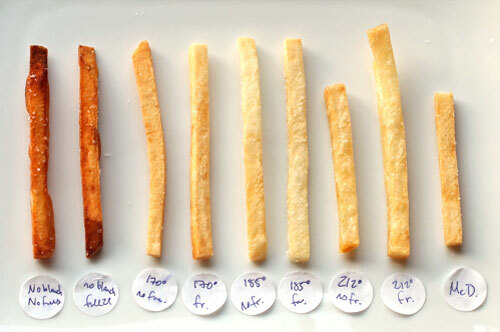 To answer that question, it's important to understand exactly what happens when a french fry is cooked. Pre-cooking the fries in a water bath the way McDonald's does accomplishes two goals. 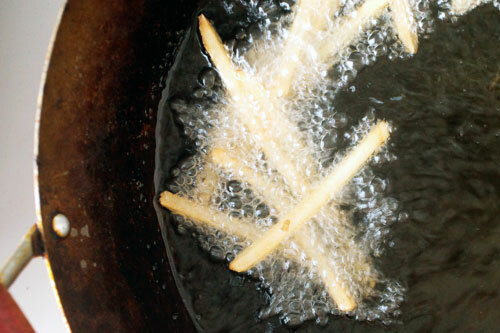 First, it rinses off excess simple sugars, helping the fries attain a light gold color, instead of a deep dark brown. Secondly, it activates an enzyme called pectin methylesterase (PME). According to an article in the Journal of Agricultural and Food Chemistry, PME induces calcium and magnesium to act as a sort of buttress for pectin. They strengthen the pectin's hold on the potato cell's walls, which helps the potatoes stay firmer and more intact when cooked to a higher temperature. 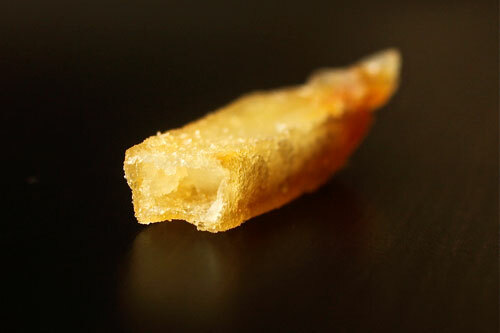 That's why the surface of a McDonald's fry looks the way it does: rather than blistering into large bubbles like a traditional double-fried french fry does, the reinforced walls form the super-tiny bubbles that give them their extra crunch. 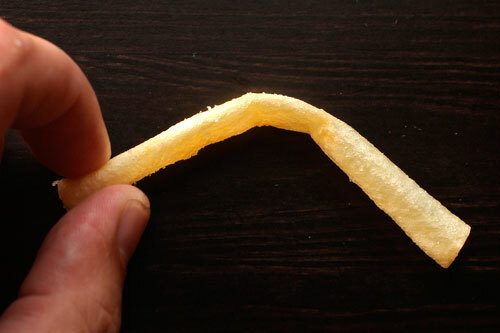 My objective just became much clearer: in order to get my fries ultra crisp, I'd need to find a way to strengthen their pectin before allowing their starch granules to burst. The most obvious way to do this is just to copy McDonald's exactly: cook the potatoes in a precisely maintained 170°F water bath for 15 minutes. I tried it using my Sous-Vide Supreme, followed by a fry at 360°F for 50 seconds, and a second fry at 375°F for 3 1/2 minutes. It worked like a charm. The fries tasted nearly identical to those that come from McDonald's. Of course, now two new questions entered my head: What about for those poor souls who don't have a temperature-controlled water bath? And more importantly, now that I've got the fries down, could I make them even better? I mean, they taste fantastic now, but we all know that McDonald's fries get soggy pretty darn fast. If these fries were really going to be perfect, I'd have to address that issue. To solve the first problem, my initial though was to start the potatoes in cold water, and slowly bring it up to a simmer. My hope was that by doing this, they'd spend enough time under the 170°F cutoff point to improve their structure adequately. No dice. The potatoes were certainly better than ones dunked straight into the fryer, but they didn't come close to the originals. Next I tried adding a measured amount of boiling water to a pot containing the cut potatoes. I calculated exactly how much water I'd need in order for it to equilibrate to 170°F. It worked a little better, but the water temperature dropped off too quickly for it to be effective. Was I gonna have to break out the beer cooler for this one? There had to be another way. That's when I thought—perhaps there is another way to strengthen pectin without having to rely on some fickle enzyme (I've never liked enzymes anyway), and it struck me: apple pie. What's this got to do with french fries? Well everyone who's ever baked an apple pie knows that different apples cook differently. Some retain their shape, while others turn to mush. The difference largely has to do with their acidity. Thus super tart apples like Granny Smith will stay fully intact, while sweeter apples like a Macoun will almost completely dissolve. Just like a potato, apple cells are held together by pectin. Moral of the story: acid slows the breakdown of pectin. The fries boiled in plain water disintegrated, making them nearly impossible to pick up. When I added them to the hot oil, they broke apart even further. On the other hand, those boiled in the vinegared water remained perfectly intact, even after boiling for a full ten minutes. When fried, they had fabulously crisp crusts with tiny, bubbly, blistered surfaces that stayed crisp even when they were completely cool. As for the flavor, if I tasted really hard, I could pick up a faint vinegary undertone, though I wouldn't have if I didn't know it was there. Even knowing it was there, it wasn't unpleasant at all. After all, I'm used to putting my fries in ketchup or mayo, both of which contain plenty of acid. Now that I'd perfected the crust, the final issue to deal with was that of the interior. One last question remained: how to maximize the flavor of the interior. In order to stay fluffy and not gummy, a lot of the interior moisture needs to be expelled in the cooking process, so my goal should be to make this evaporation as easy as possible. I figure that so far, by cooking it all the way to boiling point, I'm doing pretty much the right thing—the more cooked the potatoes are, the more the cell structure breaks down, and the easier it is for water to be expelled. To confirm this, I cooked three batches of potatoes, starting each in a pot of cold, vinegared water, and bringing them up to various final temperature (170°F, 185°F, and 212°F) before draining and double-frying them. Not surprisingly, the boiled potatoes had the best internal structure. Luckily, they were the easiest to make as well. But was there anything more I could do? I thought back to those McDonald's fries and realized a vital step that I had neglected to test: freezing. Every batch of McDonald's fries is frozen before being shipped out to the stores. I always figured this step was for purely economic reasons, but perhaps there was more to it? I know it's bad form to toot your own horn, but I'm simply amazed that these fries have been coming out of my own kitchen. I've been eating fries in various shades of good or bad constantly for the past few days, and I'm absolutely sick of them, yet I am still eating them even as I sit here and type. I really hope my wife doesn't mind greasy keyboards. You never know what's gonna set her off. About the author: After graduating from MIT, J. Kenji Lopez-Alt spent many years as a chef, recipe developer, writer, and editor in Boston. He now lives in New York with his wife, where he runs a private chef business, KA Cuisine, and co-writes the blog GoodEater.org about sustainable food enjoyment.